Le Corbusier put the surface in second place of his three appeals to the architects (‘Trois rappels a messieurs les architectes’). It is not as basic as the volume, but it is – as a matter of speaking – the face of a volume. An external appearance (of a building) consists in most cases of walls, punctured with windows and doors, etc. The windows can be regarded as ‘holes’, which often tend to destroy the form. They can be blamed (as accusateurs) to disturb the delicate balance between the original volume and its surface. To minimize its effects the treatment of the surface has to follow the same (division) lines and geometrical solutions as with the volumes. This view of Le Corbusier ends at, or at least has great sympathy for, the checkered pattern (le damier ou grille) so familiar in American factories. This geometry initially hurts, according to Le Corbusier, but these factories will become the reassuring guidelines for modern times. Fig. 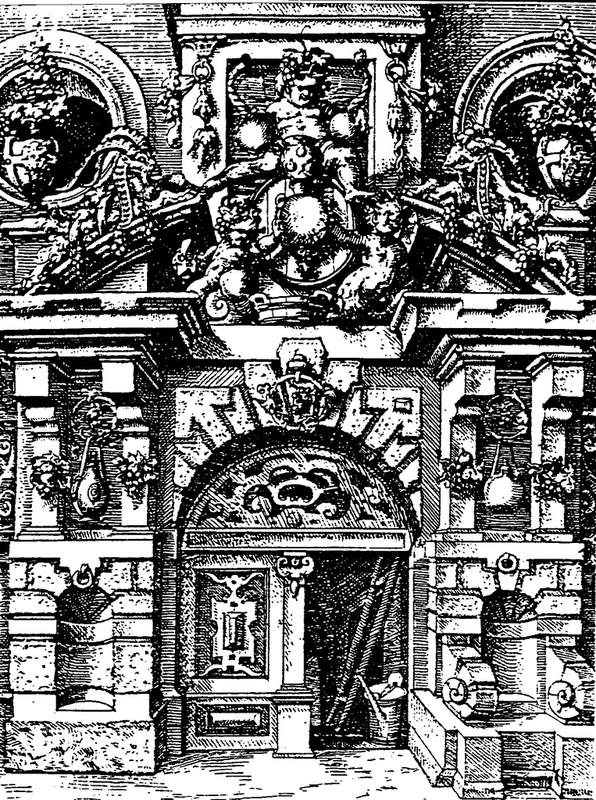 805 – Project of a façade by the German painter and printmaker Wendel Dietterlin, living at the end of the sixteenth century. Wendel Dietterlin (1550/51 – 1599) was a German painter, draughtsman and engraver, living in Strasbourg. Paulus Fürst in Nuremberg published parts of his book ‘Architectura von Austheilung Symmetria und Proportion der fünff Seulen’ from 1593-4 onwards. The first collected edition appeared in 1598 and consisted of hundred and ninety-five architectural plates, showing a variety of windows, chimney pieces, doors, fountains and monuments (fig. 805). His book was an immediate success and became a reference for designers in the seventeenth century, but also for artists of the nineteenth century, who sought an architectural and aesthetic revival (fig. 806). Fig. 806 – Some different forms of façade decoration with variations as given by James Fergusson in his ‘The Illustrated Handbook of Architecture’ published in 1855. The surface develops, in a quadralectic context, from an idea of visibility into an exploration in all kinds of visibilities. Up to the nineteenth century, the inspiration came from ‘classical themes’ (like the Mannerism of Dietterlin) or the well-trotted pathways of geometry and symmetry (like Fergusson showed) and often from both. Francisco de los Santos, prior and chronicler of the Escorial, mentioned in a manuscript of 1691 the twelve thousand windows and doors of the Escorial. This exuberance can be regarded as the apotheosis of an architectural ‘window dressing’ (in both figures of speech). The French author, teacher and architect Jean-Nicolas-Louis Durand (1760 – 1834) gave in his book ‘Précis des leçons’ (1802 – 1805) a recapitulation of the classic themes of façade variations (fig. 807). This book was written on a watershed of architectonic interpretation. His appeal for functionalism, and his credo ‘the main aim of architecture is its usefulness, not it’s liking’, opened new fields of inquiry. It was the logic of construction and geometry, which should result to attractiveness rather than a search for beauty (see fig. 657). Durand’s design of The Place de la Concorde in Paris (fig. 712) is a good example his intentions. Architecture introduced itself as a science. Every architectonic detail, in particular of the façade, could be treated as a scientific entity, just like every other visibility. The nineteenth century was an age of craftsmanship and detailed study, beauty was of later concern. Fig. 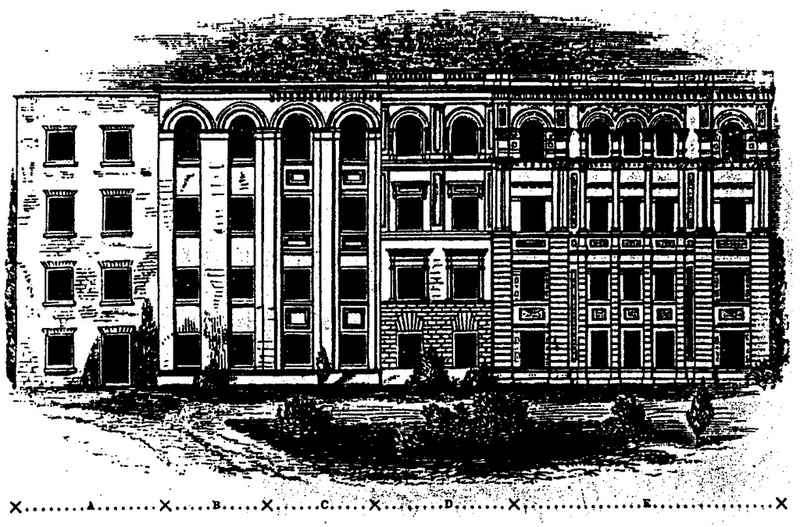 807 – Three types of façade variations by J.N.L. Durand (a – c) and an addition by George HERSEY (1999; d) are an elaboration on the classical treatment of surfaces of a building. Tetradic surface decoration was also used in America by Frank Lloyd Wright in the Alice Millard House in Pasadena, known as La Miniatura (fig. 808). The house is situated on a north eastern suburb of Los Angeles and was built in 1923. The property was for sale in 2008 and opened for the public for the first time in sixteen years. Outside pictures taken during visiting tours at the time revealed a wealth of tetradic features. Restoration was estimated to be costly, because ‘glass was incorporated internally into the concrete blocks by hand’. La Miniatura was the first of four textile-block houses in the area. Concrete blocks were stacked and connected with steel reinforcing rods. The face reliefs of the blocks varied for each project. Fig. 808 – The tetradic wall features at La Miniatura, or Alice Millard House, in Pasadena (Los Angeles) was designed by Frank Lloyd Wright in a D4 symmetry. A new element entered the architectural history of surfaces in the twentieth century. Materials like glass and steel were used to cover walls in a hitherto unknown way (made possible by technical advancements). The concept of a ‘window’ merged with the ‘wall-in-general’, and often got lost in the process. Modern (office) buildings of the late twentieth century consisted of enormous walls of (mirrored) glass, surpassing the idea of a window-as-a-hole-in-the-wall. 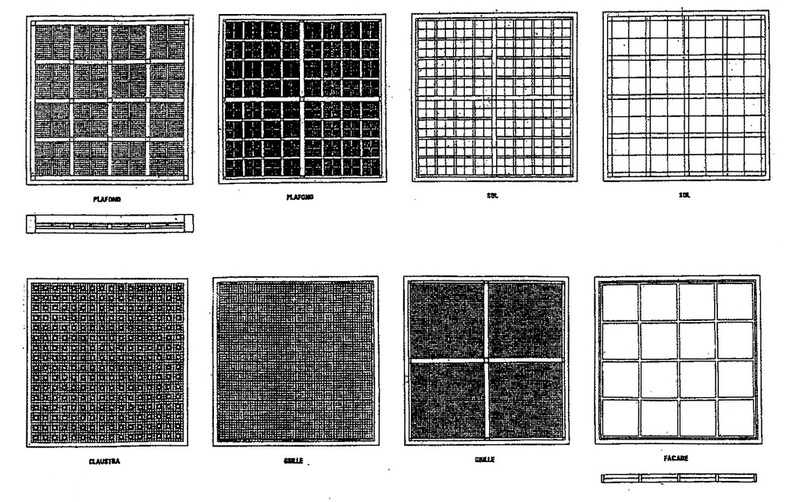 The theme of panels and grid-as-surface was fully explored by the French architect Jean Nouvel (Fumel, 1945). The construction of his innovative Cité Judiciaire in Nantes used different panels to let the light in (fig. 809, see also fig. 796). Fig. 809 – Different panels in the Cité Judiciaire in Nantes by the French architect Jean Nouvel. The Cognacq-Jay family founded a department store in Paris in the late nineteenth century. They ran a social program which included a day-care center and a health insurance plan. In 1900 a Neo-Gothic building was acquired in Rueil-Malmaison to function as a retirement home (Cognacq-Jay Foundation). An extension of some 6000 m² was realized by Jean Nouvel between 1997 and 1999, reflecting the old building. A connecting gallery between the two buildings houses the hall and reception areas. The extensions of the Maison Cognacq-Jay are made of glass tiles, providing a translucent environment (fig. 810). Fig. 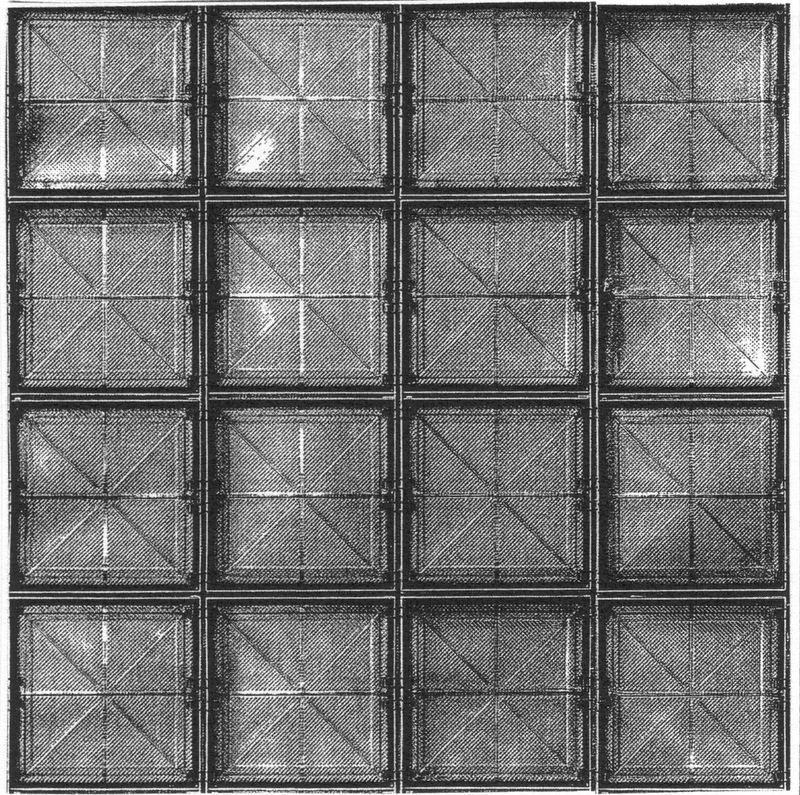 810 – Pattern of glass blocks at Maison Cognacq-Jay, Paris. The rigid pattern of the glass blocks was designed by Nouvel with the intention to refract light. Glass became one of the major building materials in the latter quarter of the twentieth century, following the statement of Bruno Taut (1880 – 1938): ‘If we want our culture to rise to a higher level, we are obligated for better or for worse, to change our architecture. And this only becomes possible if we take away the closed character from the rooms in which we live. We can only do that by introducing glass architecture, which lets in the light of the sun, the moon, and the stars’. An aesthetic in glass architecture has since been developed in buildings all over the world. It is fair to say that glass – as the transparent rebirth of molten silicon – is an epitome of the visibility of the Fourth Quadrant. Glass plays with the light-as-an-idea offers its transparency and forms it into a sparkling whole, which can only be sensed in multiplicity. The surface of a building contributes to its harmony and proportions. Often some form of decoration can attribute to the effect. Art and architecture found each other in this way, and their bond goes back to the early days of mankind. Sculptural decoration became a hallmark of many churches and temples, but were just as popular in the theaters and cinemas of the Art Deco period. The Chrysler Building in New York is decorated with motorcar motifs and has a stainless steel dome (CONWAY & ROENISCH, 1994/ 2005). The International Style, as a subdivision of the Modernist movement of the 1920’s and 30’s turned against this type of decoration and searched for elementary, geometrical forms. The design was regular and open and the materials were glass, steel, and reinforced concrete. The appearance of a surface gets a wider meaning in quadralectic architecture. Its position in the second part of the Second Quadrant (II, 2; see fig. 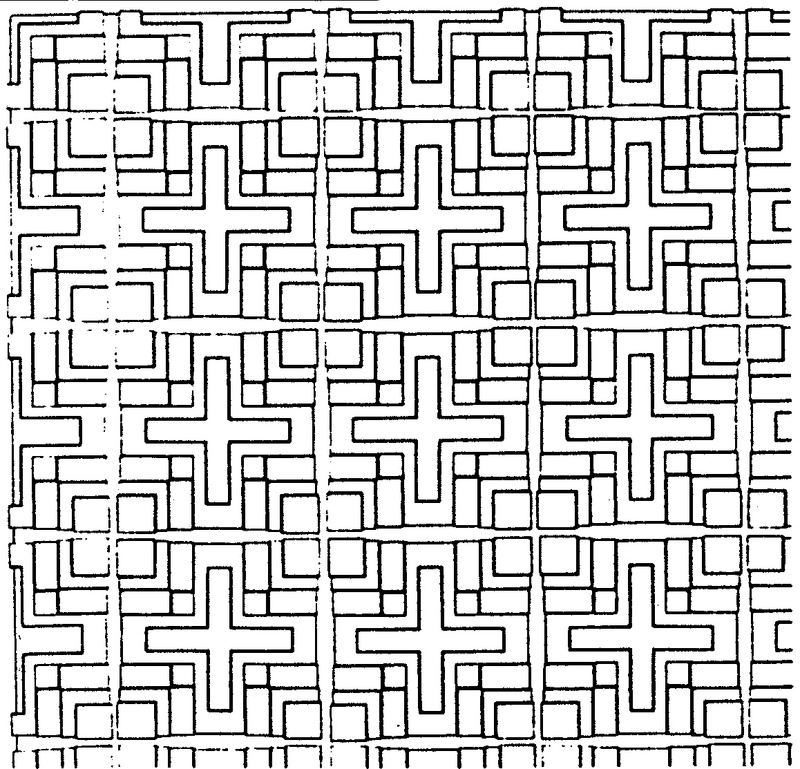 799) designates the start of a specified visibility. A building expresses in its surface exterior its identity for the first time. A comparison with the first impression in human communication is in place: face, eyes, and clothing give away a part of a personality. The exterior presence is a measure for interior bearings. Buildings are no exception: the walls, the windows and the massing put a first impression into an onlooker’s mind.